¡AV Ford Te Trata Bien! Here at Antelope Valley Ford, we study our models carefully to provide our consumers with detailed information about our vehicles. Are you in the market for a compact SUV? 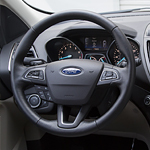 The Ford Escape is a popular model that comes with a variety of convenience features that you can read about below. The Escape comes with a standard rearview camera, which provides you with a clear image of the back of the SUV that displays on the touchscreen. There is also a Reverse Sensing System, which is standard on the Titanium and SEL. This system monitors for objects when you are in reverse and will issue an audible alert when one is detected. As you get closer to the object, the series of beeps will become faster. Intelligent Access with Push-Button Start is standard on the SE, SEL, and Titanium. With this feature, you can unlock the vehicle with your Intelligent Access key and a touch of the door handle. This feature also lets you start the vehicle by pressing the brake pedal and pushing the start button.